Skip The Line Tickets INCLUDED!! 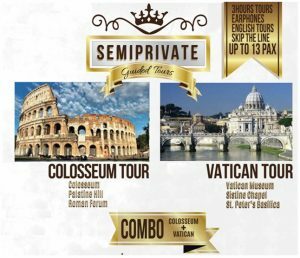 The duration of the Tour will be about 3 hours, and it will include visits to the Roman Forum and the Colosseum, with walking examination of the Fori Imperiali and the Arch of Constantine. In the center of the modern city there is the pulsating heart of Ancient Rome: a set of large public squares, the fulcrum of the political, jurisdictional and community business. The Roman Forum, absolute center of social and religious life of the Ancient Rome, occupies an old depression dominated by the most famous hills: the Palatine and Capitoline Hill, the first connected to the legendary tradition of the foundation of Rome by Romulus and decorated by huge imperial palaces, the second symbol of the religious power with its majestic Temple of Jupiter Capitolinus. In the surrounding areas, Julius Caesar, Augustus, Vespasian, Nerva and Trajan completed the area of public squares, surrounding the republican roman Forum with the Fori Imperiali. After having drained the gigantic lake existing inside the Domus Aurea of Nero, Vespasian was responsible for the construction of the Colosseum, the biggest and most famous roman amphitheater, inaugurated by his son Titus, considered one of the seven wonders of the modern world. Next to it, the first Christian emperor of the history of Rome, Constantine, erected the monumental Arch of Costantine, as an eternal memory of the famous battle of Ponte Milvio, with the vision of the cross in the sky. The duration of the small group Tour will be about 3 hours Discover one of the most beautiful and storied sites in the world with skip-the-line access to the Vatican. On this fantastic tour you will see the Vatican Museums, the exquisite Sistine Chapel and the dramatic St. Peter’s Basilica. Accompanied by your guide, you will enjoy an intimate, personalized tour of the Vatican Museums, which were originally meant for the sole enjoyment of the Pope. This lavish, intricate labyrinth is made up of 2000 rooms that stretch over almost nine miles. In fact, it is said that if you spent 60 seconds looking at every item, it would take you 12 years to see everything! In your walking tour, you’ll discover the beauty and secrets hidden within the masterpieces lining these rooms. A highlight of the private tour of the Vatican Museums is experiencing Michelangelo’s famous Creation of Adam fresco as you explore the Sistine Chapel and wander through the suggestive Raphael’s Rooms. After taking in the Vatican Museums, you will encounter another of Michelangelo’s masterpieces, the Piety, in St Peter’s Basilica. For a fascinating finish to your private walking tour, stop to admire magnificent St Peter’s Square, as your guide points out Bernini’s ingenious use of optical illusion. The duration of the Tour will be about 3 hours, and it will include a visit to the Galleries of the Candelabras, Tapestries and Geographical Maps, with a specific focus on Raphael’s Rooms and the Sistine Chapel.